Looking for a comfortable pretty collar for your canine? Stop searching as you have already found it! 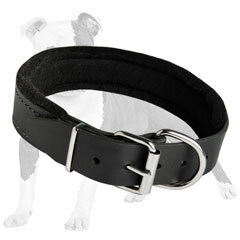 This Softly Padded Leather Collar is the collar of your dog’s dream. Main decoration and advantage of this item are selected full grain genuine leather. 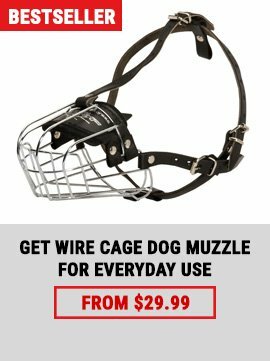 Due to its very expensive and stylish look, this collar is above competition in the world of fashion or dog training equipment. 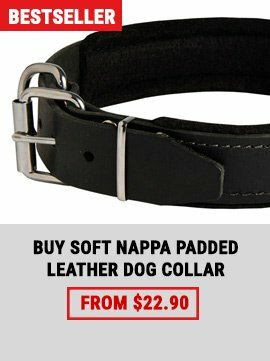 If you are a happy owner of medium or large breed dog, this Leather Collar will be much in help in coping with your pet. Due to its very simple design, this product is indispensable for everyday use and it will do the best way for training, walking or working education. This Collar is the most dog-friendly control tool as it is fully safe, comfortable and soft. Buy it right now without any doubt and enjoy your dog’s great mood and energetic behavior. It is manufactured of high quality full grain leather material. No artificial leather or wastes are used. Due to it, the collar is very sturdy and long servicing. It will easily manage with strong dog. No breakage or tear while usage is going to happen. The nickel plated hardware won’t bother you with rust metal smell or spoiled look as all fittings are corrosion resistant. The collar is fully padded with soft thick felt. It protects the dog’s hair and skin from any damages. By the way, a little bit protruding padding doesn’t let the collar cut into the skin or rub it. 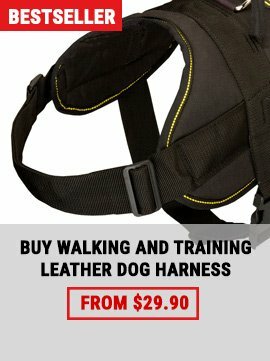 If you are looking for safe equipment for your dog, you won’t find any better for him.